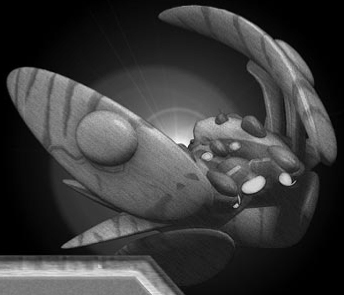 The Arbiter is a support ship that generated various kinds of space-time distortions - specifically, a Cloaking Field which obscures friendly units (-10 to detect without a Detector unit) that are within 200 yards of the vessel; a Stasis Field which can temporarily immobilize all targets within a small area (50 yd radius, up to 250 yd from the vessel, locked in a Stasis Web, Ultra-Tech p. 193, for 10 sec); and a Warp Vortex that can teleport a handful of friendly units (up to 100 tons) from anywhere in a Protoss Psi-Grid to the Arbiter's location. Statistics: dST/dHP 30; Hnd 0 (+4); SR 4; HT 14; Move 40/200; LWt. 100; Load 3; SM +6; Occ 1PVS; dDR 40/25 (+50 Plasma Shields); Loc GWi2t. Streamlined, winged.